Mediachance Photo Brush is a cool new image editor, natural and artistic media painting program, picture retouching tool, photo enhancer and Image Browser for Windows 95/98/NT/2000/XP/Vista. It has many rich tools and effects for photo adjusting and photo retouching found in much more expensive professional tools. And there are also some effects and tools you can hardly find elsewhere. It is also one of very few featured image editors supporting full range of EXIF information from Digital Camera images. With Photo-Brush you can easily correct all unwanted problems of your digital images, you can create a new painting or web graphics. Photo-Brush has all the necessary tools for editing and adjusting digital images: Adjusting levels, Gamma, RGB curves, Hue/Saturation, Brightness/Contrast and more..
Photo-Brush is also an excellent painting program with its Pressure Sensitive tablet support. With texture painting, Artistic, Natural or 3D brushes you can create any work of art. With Cloning you can turn your photos into paintings. Photo-Brush has TWAIN 32 support for scanners as well as 32 bit film scanners. It has build in powerful Auto Dust Removal system. 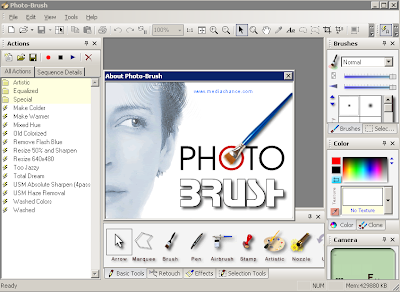 There are many filters already build-in, but Photo-Brush can also use Adobe PhotoShop (tm) compatible Plug-Ins as well. It can run the plug-ins from anywhere in your computer, even from network drives. Create amazing seamless textures from any part of your photographs or paint your own. Use them on your web page, or retouch your images with them. Try Warping or add a great touch with Image Nozzle! Add Lens Flare, Sparkles, Age the picture, Replace colors or Colorize black & white pictures; Add cool text in 2D, 3D, and drop shadow. A cool new multi threaded Image Browser was added for your convenience. You can view image thumbnails in any directory on your disk, CD, network or memory chip.